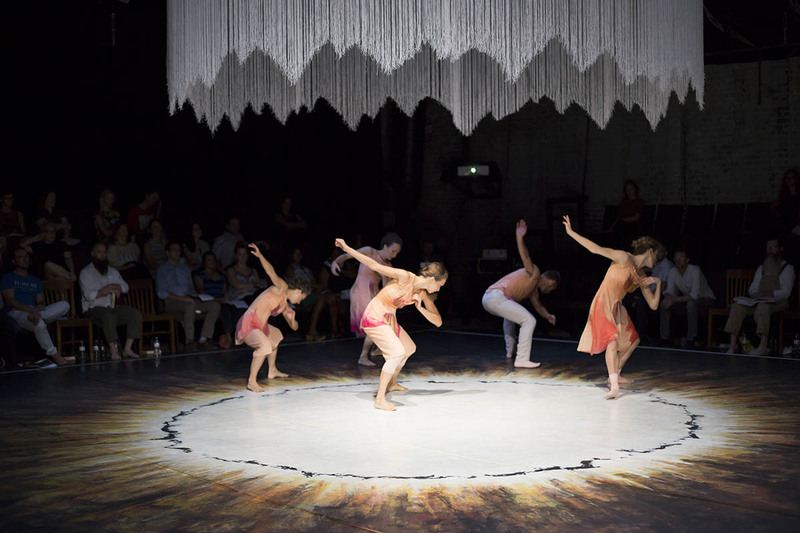 A jagged, circular halo hovers over the stage, made from hanging fringe. It looks like silver threads of rain halted in their tracks. Four sections of audience surround what will be a memorable evening. A projection on the floor looks like the bottom of a shallow pool. 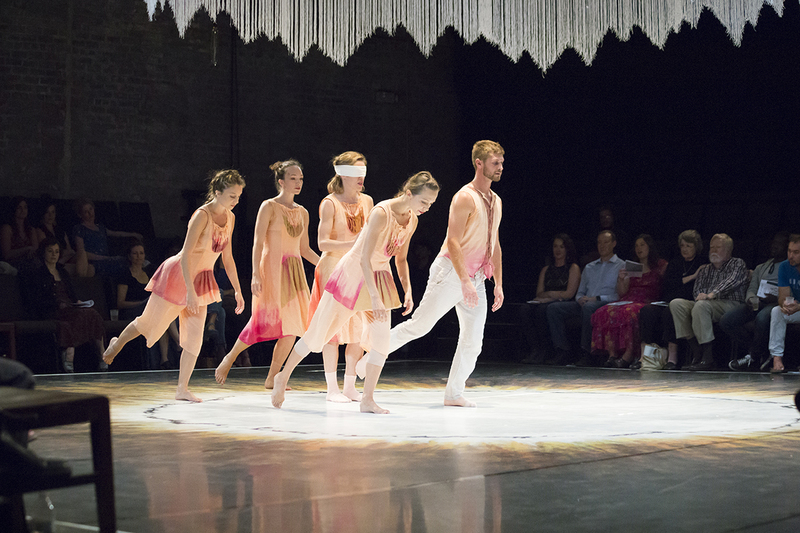 A dancer with a distressed, pink linen dress casually takes her head to the floor, her hair cascading and hiding her face, and slowly crawls backward from one corner of the stage to the other. Wooden chairs set up in the front rows of each section provide an end point for the crawling as the rest of the dancers join. It is a seamless transition from house lights and chattering into witnessing. The dancers stop to sit, and one braids her hair. Clear & Sweet is the most recent work by zoe|juniper, the well-established Seattle-based artistic duo. Juniper Shuey provides breath-taking digital projections while Zoe Scofield thoughtfully orchestrates bodies in space. 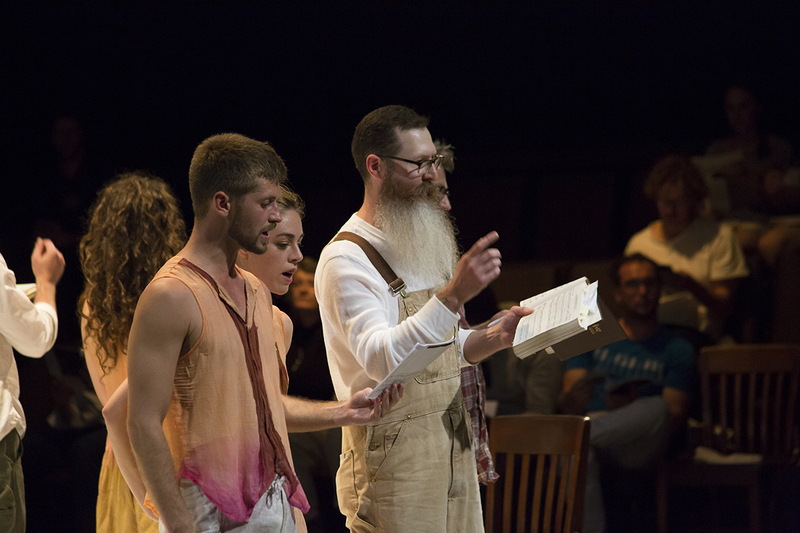 Dividing the audience into four parts echos the inspiration for the piece, a tradition called Shape Note or Sacred Harp singing. Merely by sitting down we are inserted into the categories of bass, tenor, alto, and treble – our songbooks politely invite us to sing, but also reiterate we don’t have to. Photo by James Morgan of Morgan Owens Photography. A dancer christens the stage with an expansive solo, tracing the space with jagged lines. She shifts quickly from one side to the other, hesitantly avoiding the large white circle painted on center stage. Finally, she reaches it, and blindfolded dancers are ushered in to lay on the ground next to her. Suddenly, ringing, boisterous tones fill the room – they’re coming from four singers standing in front of each section. Lying supine, the dancers gentle roll back and forth, beginning a phrase of intertwined limbs. The startling combination of song and dance captivates the room with an almost ceremonial atmosphere. The marrying of Sacred Harp singing and contemporary movement, the former rich in tradition and the latter known for breaking through conceptual and physical norms. The foreign combinations of “fa” “sol” “mi” and “la” ring through my ears as the dancers establish themselves as extensions of one another. Still blindfolded, they primarily use touch to move through asymmetrical tableaus, pausing to allow the image to resonate. It’s hard to tell if this movement is choreographed or very skillfully improvised, but by trusting each other they earn my trust in their collective body. The unexpected shift becomes one of the most memorable moments of the night, as it shatters the idea of composed performance and humbles everyone’s expectations. A choreographer’s worst nightmare becomes a relevant confrontation of the pressure of societal performance we experience as humans. Solos and duets throughout the piece convey not only stunningly trained and technical dancers, but masterful artistry and emotion. Each one tells a story, sometimes literally. At one point, dancer Ana Maria Lucaciu does blindfolded plies and tendus in the center ring as fellow dancer Troy Ogilvie tells a story from Lucaciu’s adolescence; the other three members of the cast practice a dance phrase together. We hear about her rigorous experience in a strict ballet academy, as well as a devastating school talent show breakdown – perhaps mimicked by the breakdown earlier in the show. Lucaciu’s isolated and ritualistic movement juxtaposes the conjoined effort of the trio, causing us to question whether hierarchal perfection is more fulfilling than a level playing field. In a society where we are often encouraged to figure things out on our own, Clear & Sweet reinforces the value of group mentality. Zoe|juniper is an experienced and decisive artistic duo, threading together movement themes and genres into an impeccably structured story – not of a narrative kind, but of an intensely generated experience. Electric guitar, cold lighting, and digital projections amplify pure voices and bodies – turned into a reality that can’t be experienced any other way. With many trends of taking performance to site specific locations, zoe|juniper brings us back to what makes theater so extravagant yet so relatable at the same time. A delightful combination of the religious-turned-secular tradition of Shape Note singing and contemporary dance, Clear & Sweet provides a permeable and understandable image, something seldom found in contemporary art performances. The night finished with one last song, in which the audience was invited to sing along. Although my tones were neither clear or sweet, the residual communal feel of the evening left me feeling whole and satisfied. Clear & Sweet was performed at On the Boards October 20-23, 2016. More information on the work here.